Crazy as it may sound, buying this truck will be a real step up for me. 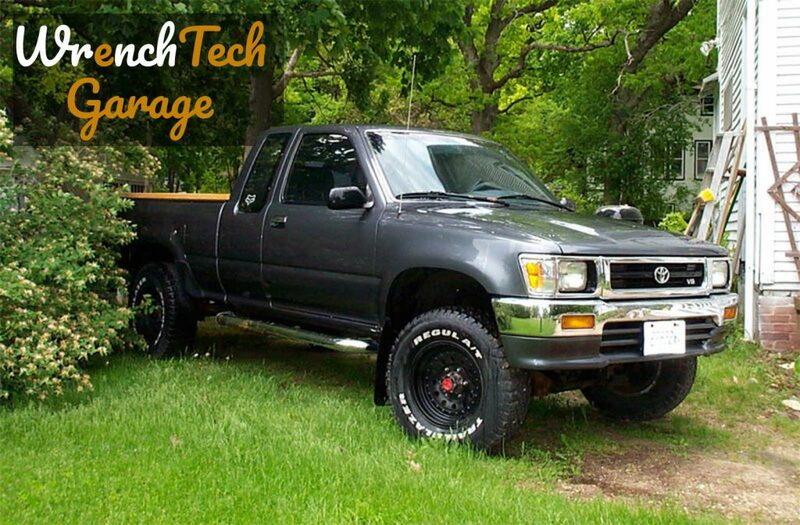 I have owned several earlier generation Toyota trucks in the past and absolutely loved them. This generation of truck was reputed to be a substantial improvement over those trucks, so I am looking forward to step up to a 25 year old truck! What can I say, I am a Toyota diehard. This is a Wisconsin truck that I picked up with only 115,000 miles on the odometer and a blown engine (the infamous 3VZE, 3.0l V6). A rod broke and punched a hole in the side of the block right behind the A/C compressor. The truck has the DLX trim package and a 5-speed manual transmission. It looks good in this picture but it has some rust as you would expect from a 24 year old truck that has spent its entire life in the Milwaukee, Wisconsin area. It needs a new hood, tailgate and rear bumper. The driver’s side cab corner needs a small amount of rust repair. The frame is solid, except for the tubular crossmember that holds up the rear of the gas tank. The leaf springs and the driveshafts will clean up nicely and I have already secured new used control arms and torsion bars for the front suspension. The rear axle housing is getting sandblasted and will have the drum brakes replace in favor of a custom disk brake set-up. And last, but not least, The engine needs to be replaced. It sounds like a hell of a lot of work, but I think on balance there is enough good about this truck to justify saving it. I think the picture above supports that proposition. And for me, working on these Toyotas is as much fun as it is work. I started by pulling the engine out. It was my first time working with the 3VZE V6. It is a little more of a handful than the more compact 4 cylinder engines I had been working on and so I had a little apprehension about doing the work. I didn’t need to worry, it came out like a dream. First, I stripped off the accessories, the radiator, the PS pump, the A/C comp, the alternator, the exhaust manifolds and the intake ducting. Then I disconnected the driveshafts, the transmission crossmember and unbolted the motor mounts. I put color coded paint markings on all the vacuum hoses, disconnected the wiring harness at the computer and the engine, transmission and transfercase were ready to be lifted out as one unit. Using an adjustable lifting sling and a hydraulic cherry picker hoist, I was able to get the combined assembly out without any trouble at all.